Is YOUR On-Site Shelter Safe Enough? Turnaround Logistics, Inc. is the industry’s leading authority on minimizing your plant’s risk employing the ultimate Inflatable Blast-Resistant Shelter: Dynamic Air Shelters. Plant shelters used for breaks or meals, weather shelters, change houses, orientation, training, meetings, tool stations, offices, laboratories or equipment assembly, inherently carry an increasing risk to on-site personnel. As an Authorized Dealer for Dynamic Air Shelters, Turnaround Logistics not only provides the safe shelters you need, but the services that ensure your compliance with API 756 is hassle-free. Is YOUR On-Site Shelter in Compliance with API 756 Mandates? The American Petroleum Institute’s (API) RP-756 provides guidelines for managing risk from explosions, fires, and toxic material releases to on-site personnel located in shelters. 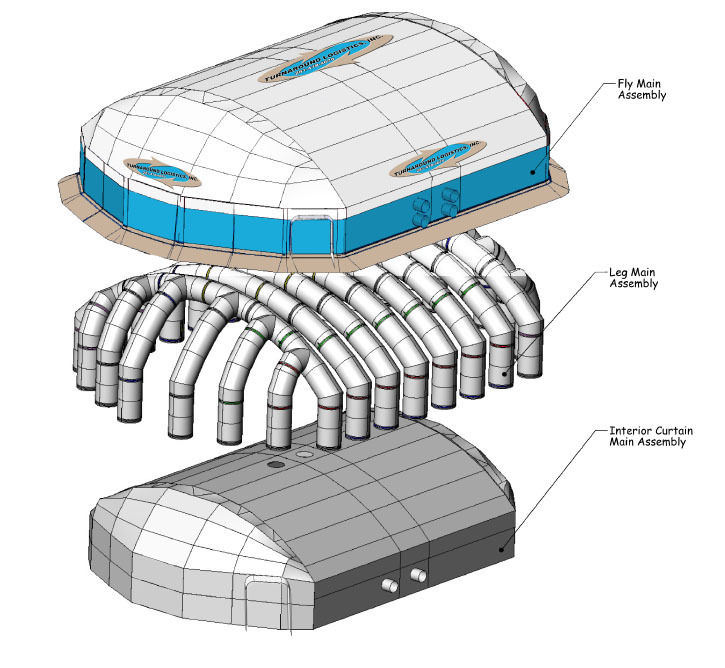 Air-inflated structures, or Dynamic Air Shelters (DAS), are considered to be the optimal on-site solution to minimize these risks and comply with API’s newly suggested practices, and Turnaround Logistics, Inc. is the recognized leader in Blast-Resistant Shelter solutions. Dynamic Air Shelters are the ONLY Turn–Key Solution for Maximum API 756-Compliant Protection, Portability, and More Wrench Time. Dynamic Air Shelters (DAS) are highly versatile, inflatable buildings designed to be rapidly deployed and fully functional on-site within hours. They are used for industrial, military, and commercial environments. In addition to DAS’ many safety and API 756 compliance benefits, Turnaround Logistics, Inc. leverages DAS technology and products as the focal point of our company’s superior turn-key solutions. • Blast Resistant: Certified to withstand exposure to explosion-induced waves with pressure exceeding 5 psi and durations over 200ms. Ballistic resistant when tested with 81mm, 104mm, and 155mm shells. • Heat Flux Resistant: Unique fabrics and features mitigate risk to workers from situations of flash fire caused by accidental hydrocarbon combustion. • Superior Portability: Utilize minimal space with a two to three hour inflation time for large structures. • Multiple Configuration Options: Various amenity and deployment options for modular, expandable, multi-unit complexes and may include electrical, lights, HVAC, air filtration systems, and flooring. • Extreme Climate-Ready: Can withstand regulated snow load, wind forces minimum of 130 Km/hour (80 mph), and category 3 hurricane. Capable of withstanding extreme temperatures ranging from a staggering 45ºF to 158ºF (7ºC – 70ºC). • Shelters range in size from 400 to 40,000 sq ft.
Here’s a look into how and where Dynamic Air Shelters are manufactured. Review the results of API’s Tent Testing Program for process plant tent responses to vapor cloud explosions. For a customized plan to meet the unique needs and turnaround demands of your worksite facility, CONTACT us today!